Ichisan just dropped a brand “spanking” new mix and we’ve got it right here folks. We’ve been keeping tabs on the Spaceman from Slovenia for quite some time now. Through the autumn blossom to the deep slumbers of hibernation, from the other side to here & there, from the bubble bath with a Mai Tai, to an iced tea behind the sun, we’ve been with him for it all. Now it’s time to go all the way with the just-released ‘Naked Mix’. This is Ichisan in true form, and it just so happens to be one of his longest releases to date. There are a lot of things to get excited about here at T&A and by now you should know that when he releases new music we get extra…giddy. Once again the tracklist is blissfully obscure and lacking in any major connection to mainstream charts, adding even more personality to his unique presence. Not that such a thing matters provided the music is good, but there is just so much mystery to this artist’s sound, and it’s human nature to find excitement and subconscious reward in the unknown. Each mix, each new song, is a new discovery in itself. The mix commences with a brief, but colorful arrangement of synth beats to get you primed and ready for your inevitable journey into the uncharted Cosmos. It’s important to stretch before such things you know. After take off the ride begins and it’s all gravy from there on. Vast arrays of synthesizers constantly develop over rich funky undertones, and continue to build layers and swim into each other. The sounds collide resulting in stunning, psychedelic soundscapes. Heavy disco bass lines are broken down and collapse with the raining melodies, forming a razor edge and bringing tough love and momentum to these beautiful compositions. You can’t review this mix track by track, that’s not how Ichisan mixes work. Flowing deep in the vein of his previous works, the ‘Naked Mix’ blends seamlessly into one musical organism. It is in these idiosyncrasies that we find solace in the signature grace that he carries on with time and time again. For those who are just hearing about him now, his association with electronic music is limited solely to the fact he uses electronic means to produce his. We frown using the term “musician” lightly when referring to electronic music. His skills aren’t restricted to a laptop. Style and nuance aside, his productions are legitimately recorded with real synthesizers and instruments, and his live performances don’t disappoint either. After you spend enough time in his various realms you’ll find evidence to our theory that he may very well have the sonic secrets to the universe. The way his music flows and progresses forward, it seems as if he and the music he plays are one single entity. 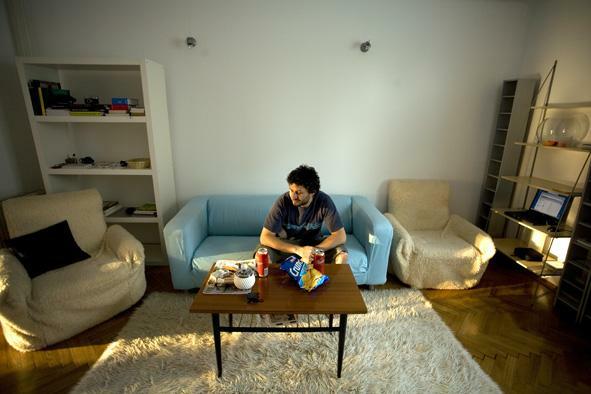 The ‘Naked Mix’ is a perfect summary of his style and intrinsic sound. You can listen to it below. Ichisan will be returning to the US this month to open for The Disco Biscuits at the Electric Factory in Philadelphia, but we’ll tell you all about that very soon. New Music from Electro-Indie Group, Silverclub! The UK’s been on the musical up and up for decades now. From metal, to rock n’ roll, and pop, the Brits across the pond are one of the most constant, ubiquitous influences in our music. With revolutionary music from acts like Orbital and the Chemical Brothers spanning from over 20 years ago, to the modern underground house scene in London, it’s apparent that electronic music is no exception. Don’t get too down though folks, we’ve got roots too (Detroit and Chicago house for starters). 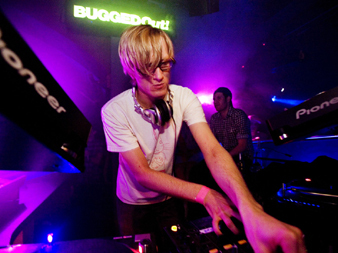 In the last decade, the electro-indie movement has been especially huge. The days of new wave are once again upon us, and branching off into limitless blends of modern and old influences alike. Enter the Manchester-based electronic indie band Silverclub. Although they might not register to American audiences, they’re building a solid following East of the Atlantic. This group takes indie and punk-rock flavors and applies them to synthesizer driven grooves and beautiful arrangements. There is a distinct softness to the vocals, but the music that they intertwine with is textured, and pulsating. It sort of reminds you of The Klaxons’ synth-heavy take on indie rock, only less intense and objectively danceable. Although they are quite heavy with vocals and pop style, they are certainly something to break a sweat to. Well we brought these guys up for reason. We try to offer a little something for everyone here you know. This week Silverclub released two sparkling new tracks from a forthcoming EP due this April, so we thought we’d bring them to your attention. Both of these new tracks are available on Soundcloud, which you can visit here, or through the links below. “Trouble”, the first of the two new releases, is a more fast-paced synth-rock tune. The second of the two, “Gravity”, shows the darker tendencies the group can be capable of, mixing haunting vocals that overlap a heavy perpetual house groove. Both are a good listen and worth the 11 minutes it will take out of your day. 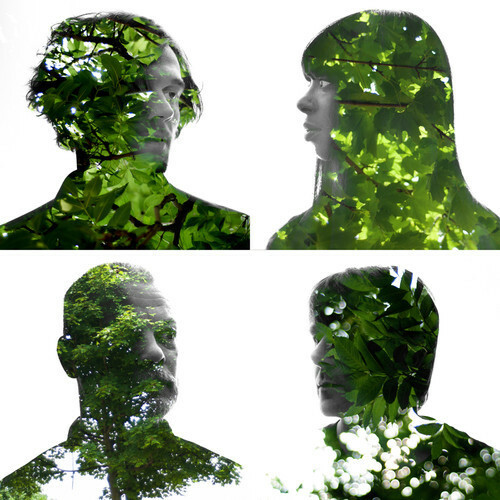 Their music might be not be necessarily innovative, but what they do, they do very well. There’s three dimensions to their existence. These guys aren’t DJ’s, they are live performers, and very consistent ones at that. Unlike some other bands in the genre, Silverclub has a powerful stage presence. The time frame between releases versus the success of the band overseas tells us they work hard on their tunes. They’re serious. They’re motivated. They clearly have a firm understanding of the anatomy of their music and equiment, and that commands respect. 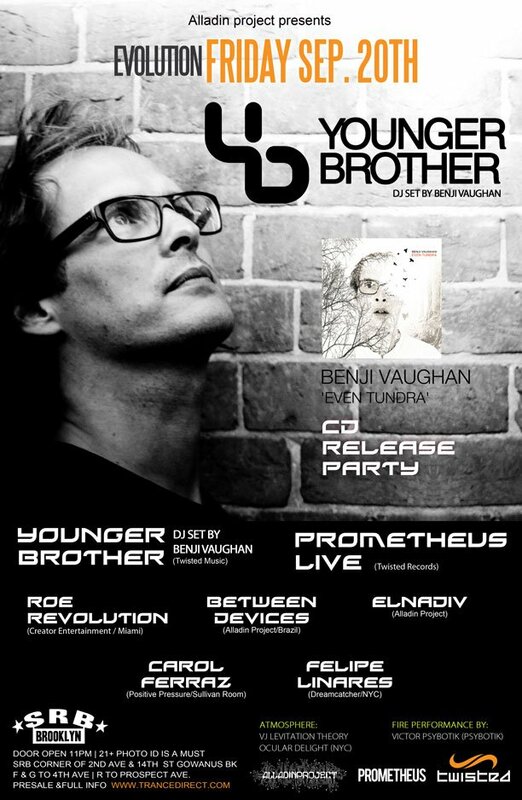 To support his newest release ‘Even Tundra‘, Benji Vaughan, aka Prometheus, will be playing at SRB Brooklyn this month! On September 20th in the empty warehouse district of Brooklyn, New York, this venue will be host to yet another prestigious electronic event. The show will feature a headlining DJ set by Younger Brother and live performance by Prometheus, as well as five circulating openers. Minus a few random gigs a year(if that) with various acts, Vaughan hasn’t made an appearance of this magnitude in the Northeast since Camp Bisco VIII 2009, where he also shared the bill with Younger Brother. The venue is excellent too. They definitely pack the place up when the bigger acts are booked, but there’s a lot of floor space. Other than one little adjacent dive bar and the very nearby subway entrance, there’s nothing but street lights and shadows for blocks. Sounds scary but it’s not folks we assure you. Twisted Records is celebrated for it’s unique collective of musicians, and the originality of each of the artists signed. The two acts billed are both creators of hauntingly beautiful psytrance and experimental electronics. Both dismiss any notion of boundary and push the envelope with every track they produce, and both have Benji Vaughan behind them. He’s a mad scientist. This will definitely be an interesting, and very weird evening. 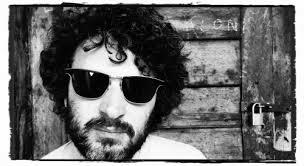 ‘Even Tundra’, available now, is the first solo album he has released as “Benji Vaughan”. The material on his new solo project is a lot more ambient and exploratory, a step in a different direction from the dark and intensely melodic psytrance of the headlining Prometheus moniker. What mix of musical sorcery will take place is up to you to find out. His set alone is worth attending. As a musician himself, and literally the supervising album producer at Twisted Records, his experience shines on stage. No gimmicks, straight to the point. He will also be doing a DJ set as Younger Brother which has the potential to be epic. The group was founded as a “psytrance supergroup” of sorts by him and Simon Posford (Hallucinogen, Shpongle) but various other members have been involved as well, such Marc Brownstein of The Disco Biscuits, Tom Hamilton of Brother’s Past, and Joe Russo. The last album, titled ‘Vaccine’, was very focused on vocals and song writing, leaving out a lot of the characteristics of their previous work. However, they are currently working on a more “electronic” version of the release says YB. No matter how artistic or refined a DJ is, they love giving fans a taste of some fresh productions they won’t find anywhere outside that show. That being said, we’re sure that some of the new material will be heard, it is the theme of the night after all. Feel free to express your anger if we’re wrong too, we have a wonderful comments section. Hope to you all at the show! 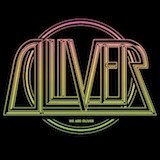 Over the last year the production duo Oliver has basically etched themselves into the charts, and for good reason. The recently released Mechanical EP was a colorful, enigmatic collection of originals, and the tip of the iceberg. Known for their vivid and crisp synthesizers, and to-the-point breakdowns, whether up or down tempo they seem to nail it every single time. Just a month ago they released a provocative down-tempo remix of “Her Favorite Song” by Mayer Hawthorne that could get a monk to abandon his celibacy in a heartbeat. Not only successful in the studio, they tour constantly and have built a solid repertoire for their live shows. 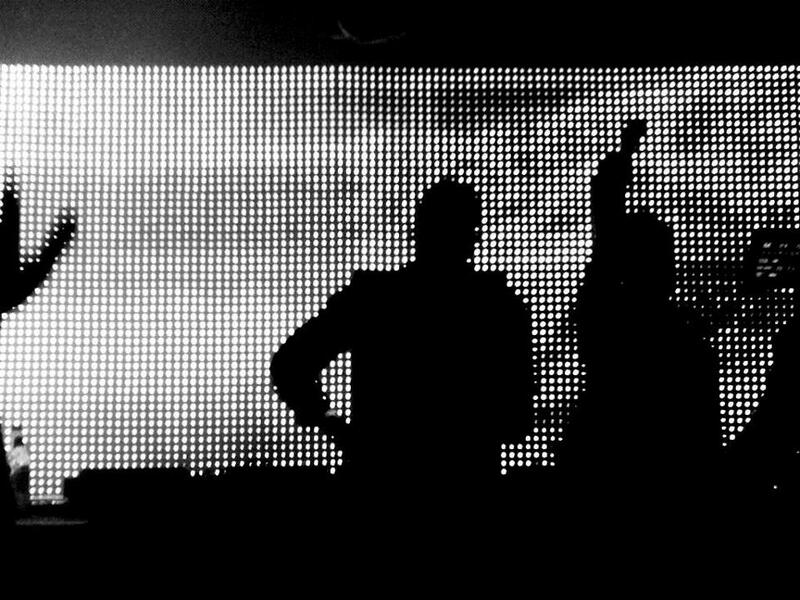 They make some of the toughest disco-house around, there’s just not a better way to put it. Their newest tune leaves a lot to be desired however. Just a few days ago they released the Bonnie McKee “American Girl (Oliver Remix)“. In the shadow of their discography there is something about this song that just rubs us the wrong way. Coming off a bit bland and cookie-cutter, the song reminisces the more tasteless side of the Los Angeles club scene they are immersed in. When the verse enters, the breakdowns are OK at best, but the song refuses to stick out. The chorus is as plain as the day is long. Oliver is capable of much, much more, and we hope to seem them break more boundaries. You just can’t fake it, that’s not what we are about. Listen to it in the link below and form your own opinion on the matter, then get back to us! 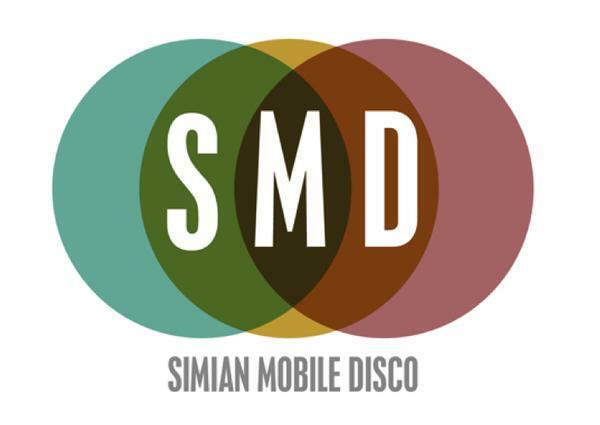 Jas Shaw of the UK minimal house kings Simian Mobile Disco was the focus of some controversy this past weekend. Last Friday Jas Shaw took the stage in Warsaw, Poland to commence his DJ set only to have his music received in a rather unpleasant reaction. Fans gathered at the Wynajecia Club for what they thought to be one of the reputable live performances from the duo, but were instead greeted with the polar opposite. Promoters billed the event as a live show unbeknownst to Shaw or James Ford (the other half of SMD). When only one of the two members appeared on turntables, and the live rig nowhere to be seen, dismal confusion ensued quickly. Although having just released a new live album recorded during their fall tour, they initially wanted the show billed as a DJ presentation. Due to the fact that the event flyers and advertisements were in Polish, the error sadly escaped the attention of Simian. By neglecting their wishes, whether intentional or not, the promoters of this event showed an immense lack of professionalism which was unfortunately reflected on the artists themselves. Musically the live act is a lot different from their DJ sets and also carries a higher rate for selling out venues, which probably contributed to the frustration. 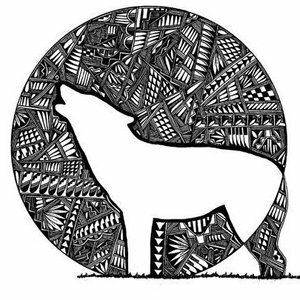 Despite being the same artist and though there are similarities, the contents of the two vary in many ways. For example their remix catalogue is more limited to the confines of the turntables, as opposed to their productions which are tweaked and performed live, and often improvised. In response to the solemn atmosphere Shaw, played the event from 1:30am to sunrise and James Ford made a formal apology yesterday. Any artists of principal are indifferent to whether or not their show sells out or make headlines. However, nobody wants a house full of angry disappointed fans, especially when the artist in question is inadvertently to blame. Put simply, bad promotion is substantially worse than no promotion, and these two made respectable gestures to give their fans some closure.